Intervening is complicated. Were we intruders entering a neighborhood? Were we bringing some sort of lasting influence to the park? Were the people who used the park involved enough in our spectacle? Who might use the chairs that we brought there, and in what capacity? The park itself has little seating because, ironically, authorities do not want people to congregate, especially after dark, for fear of the drug deals that might occur there. At the same time, the park is one of the only places in the Point for smaller children to play. Relatives often watch from open windows looking down from above. It is, certainly, a complicated space with many competing narratives. Last fall, Salem Public Space Project gathered in Mary Jane Lee Park to read poetry and sit on blue chairs. We had found these chairs in a variety of places – online, on the street – and had painted them blue, a color that for some reason consistently reminded me of the United Nations. At the same time, it was also a playful, stand-out color that would be hard to miss in the landscape there. Each chair was given a name by the person who carried it to the park, where they were placed in a semicircle. After the reading was complete, the chairs were dispersed throughout the park to places where it seemed that a chair might belong. Children gathered for the reading and also helped to distribute the chairs. They seemed fascinated by this burst of color and activity in their park. We returned several times over the subsequent week to check on the chairs. The first time, they had all been moved into a single line by the younger children in the park. We met one of the girls who had been at the reading, and she said that they had done so to “protect” the chairs from the older children, who had either been attempting to shatter them, or use them to bring them that much closer to doing a slam dunk on the netless basketball hoops nearby. When we returned again, the chairs had vanished. On closer inspection, we only found fragments scattered throughout the park. It was a sad moment. The questions about intervention returned. Was this destruction itself a message the older children were relaying to us? Was it a sign that we were not wanted there? How had the chairs been destroyed, and when? Ideas of Orwellian surveillance went through my mind – how could one know the wheres and whens of destruction? Why was it so important to know? 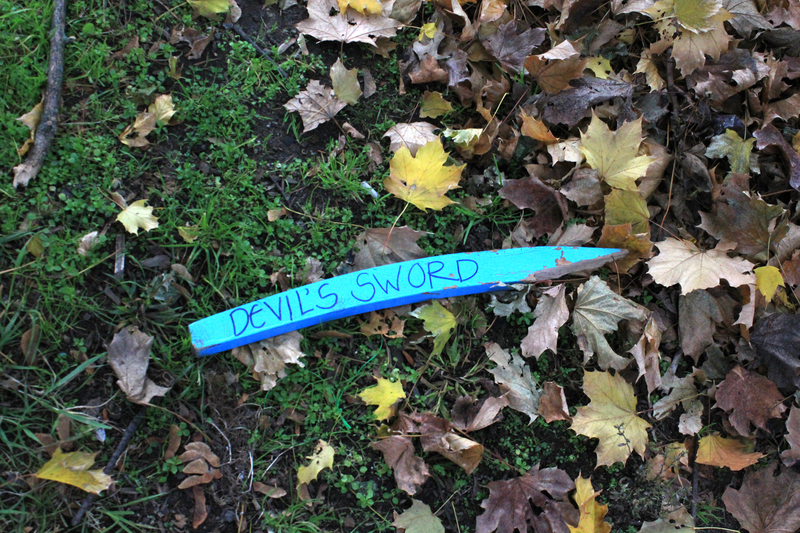 They had scrawled graffiti on the shards we found – names, sexual suggestions, and the rather memorable “Devil’s Sword” on a particularly sharp section of chair backing. It was as if they had taken the time to spread the pieces as far apart as possible, ranging across the park, some hidden behind cement roadblocks or trash-bins. It seemed almost studied – a total destruction. I imagined them fighting with the pieces. They had themselves made use of the chairs for their own forms of play, of expression. Nearby there’s another small park, which the city of Salem only completed several years ago. It sits on the edge of the Point, and the city hopes that this park will encourage more dialogue between the more frequented parts of downtown Salem and the Point itself. As if to proclaim this fact, a large wall-mural was placed near the park last year. 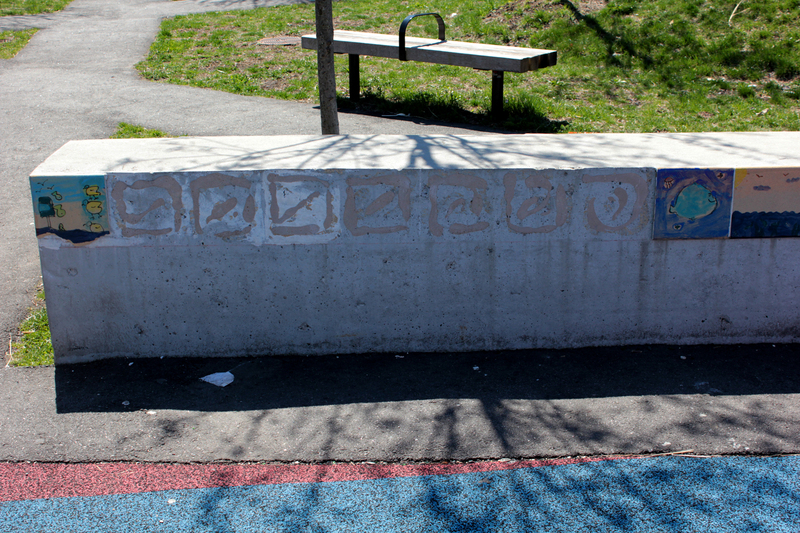 I did notice on a recent visit, however, that many tiles that have been placed by a local artist along one of the park’s retaining walls had been removed. Had they not been properly attached, or had they been pried off and carried away, to adorn walls or be ground to dust, or something somewhere in between? Things are broken, taken, and destroyed for a variety of reasons. We don’t always know why, and there are a range of possibilities: frustration at a limited range of options, resentment at interventions that don’t “change” things, or just plain destructive, adolescent fun. In a certain sense, these destructive acts are their own form of artistic intervention. They are also a form of communication that must be heard. Months later, we encountered some of the younger children that had attended the poetry reading. Claudia mentioned the destruction of the chairs, and one of the girls told her that they had not, in fact, all been destroyed. They had themselves “saved” one and still had it. Intervention involves breaking things. It involves breaking in, changing, moving, disturbing the flow and, perhaps, reconfiguring it. Things are saved, things are destroyed. But it’s a form of dialogue that does not involve words, but actions within space. This entry was posted in Dynamic Participation, Public Space Actions, The Point and tagged engagement, image narrative, Michael Jaros, parks, participation, public space questions, the point by jellybeancity. Bookmark the permalink.